David Collins, author of the sea-adventure book Shanghaied, will be the featured speaker. Shanghaied is based on a true story. Pelican Point Book Club, David Collins is luncheon speaker. The Greater Los Angeles Writers Society is proud to present a talented slate of authors at the Annual West Hollywood Book Fair at West Hollywood Park from 10am to 6pm at GLAWS Booths. David Collins, author of the award-winning book Shanghaied, is one of the Ten at the Top speakers at the upcoming Big Orange Book Festival on the Chapman University campus, Friday and Saturday, September 21 – 22. Rothschild’s Book Club Newport Beach, David Collins is luncheon speaker. Mysterious Galaxy Redondo Beach will be holding a Local Author Meet and Greet. As a local independent bookstore, it is our aim to support our local authors and writing community. David Collins spoke and presented his book Shanghaied at the Covina Library’s 50th anniversary celebration. San Diego Military hospital sponsored a BBQ for the men and women who have been wounded in service to our country. David Collins participated by giving each veteran a signed copy of his book Shanghaied. The Greater Los Angeles Writers Society (GLAWS) at the 2012 Los Angeles Times Festival of Books. 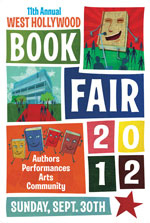 in Booths 970 at the Los Angeles Times Festiva l of Books. Festival held at University of Southern California. Shanghaied has been named Finalist for Young Adult Fiction in ForeWord Reviews Book of the Year Awards. Winners to be announced in June 2012. Book Signing at Mysterious Galaxy bookstore, 2810 Artesia Blvd., Redondo Beach, CA. “Author David Paul Collins at Books and Books on Friday March 23 for Cayman Islands Launch of his fictionalized memoir, Shanghaied. Based on interviews with local mariners Austin Bothwell and the late Orman Whittaker as well as Collins’ real life experiences as a merchant seaman, this story depicts the dangerous life at sea in the 1950s. The Greater Los Angeles Writers Society is proud to present a talented slate of authors at the Annual West Hollywood Book Fair at West Hollywood Park from 10am to 6pm at GLAWS Booths #TBD. This event is so popular, GLAWS takes an entire tent! Award-winning David Paul Collins will appear and his book Shanghaied will be available for purchase. Mr. Collins will sign his book for attendees. Almost 30 author/members are scheduled to appear.